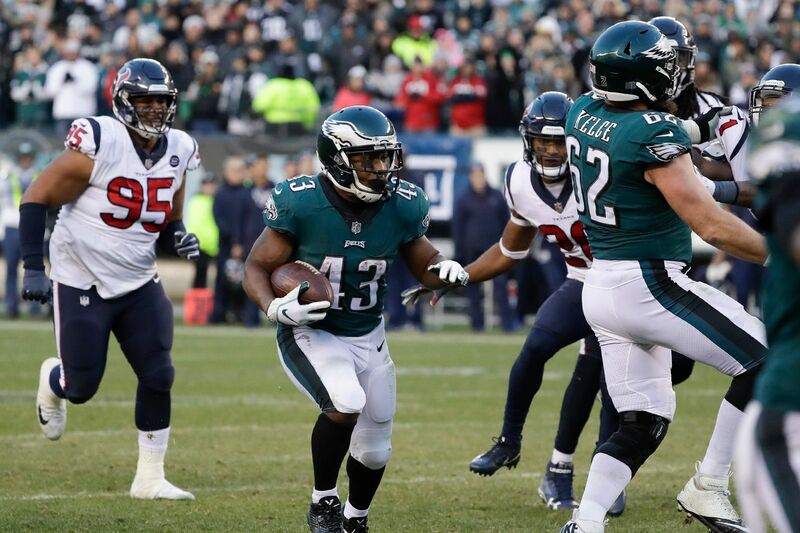 Darren Sproles runs for a first down late in the fourth quarter. It was a glimpse into the nature of the smallest, most respected player on the Eagles’ roster, the competitiveness that has pushed Sproles through 14 NFL seasons and a career that could land him in the Pro Football Hall of Fame, and on the next play, coach Doug Pederson and Foles obliged him. The Houston Texans tried to cover Sproles with linebacker Zach Cunningham. Cunningham is 24 and Sproles is 35, but this was still the sort of one-sided matchup you see on a Discover Channel program about predators and prey. Sproles zoomed past him on a wheel route, hauling in a lovely, feathery pass from Foles for a 31-yard gain, setting up another Eagles touchdown. He did it all afternoon throughout that thrilling 32-30 Eagles victory, racking up 119 total yards, scooting for 16 on a draw play in the final 90 seconds to give Jake Elliott a shorter look at a game-winning field goal, compelling a question on a matter that Sproles himself had once considered settled. In July, after missing most of the 2017 season with a torn ACL, Sproles had published a letter suggesting that he would retire after this season. But now that he has come back from a hamstring injury that sidelined him from early September to early December, now that he has scored three touchdowns in four games and shown he can be the same player he has always been, he’s not really going to retire, is he? Who would criticize him for changing his mind and choosing to come back, and who would criticize him for walking away? No one would. No one. Sproles’ teammates and peers hold him in such esteem that it’s difficult to convey their admiration without it sounding as if a 5-foot-6, 190-pound water bug has turned the biggest, toughest men in sports into a room full of Pollyannas, but there’s no way around it. They speak of Sproles with a kind of reverence reserved for only the most idealized role model. To a man, they use the same word to describe him – professional ­­– but even that term doesn’t quite capture the regard they have for him. Have you ever encountered someone you wanted to emulate, but you knew you couldn’t because it would be too damn hard, because it would demand too much of yourself, because the person was setting a standard that you yourself recognized you could never reach? That’s Darren Sproles, to the team that last won the Super Bowl. “Walk-throughs – not practice, not games, just regular walk-throughs, he’s still doing punt returns and kickoff returns and running full speed,” safety Malcolm Jenkins said. “Everybody else is jogging, just kind of slapping it out there. He’s still taking every step full speed, runs all the way to the end zone, things that nobody else would do. And then we wonder why we see the same thing out on the field. Darren Sproles dodges a tackle by Texans safety Justin Reid. Over those 11 weeks that he sat out – the injury was more than the average hamstring strain, but he won’t reveal the true diagnosis or full severity – Sproles feared that he might not play again, that he might not fulfill his purpose in returning this season: ending his career on his own terms. That worry trickled down to his teammates as they saw him in the trainers’ room each day and in every team meeting. “We’re always aware of how important he is to the team and what he brings,” Brooks said. “It was definitely tough to see him hurt.” Yet the Eagles banked that he would come back, never placing him on injured reserve, holding out hope that he could and would deliver them the sort of performance he did Sunday. “To have the role I had tonight, man, it felt great,” he said. So it’s on to FedEx Field and the Redskins next Sunday. One more game with the playoffs at stake, maybe the last game in a marvelous NFL career, and the Eagles could do worse than relying on Darren Sproles one more time. They could do worse than getting him the bleeping ball and letting him be himself.